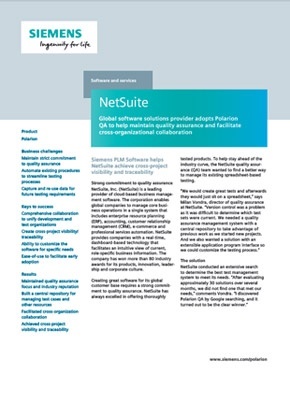 As a world leader in business management software, NetSuite knows its customers expect great software and a strong commitment to quality assurance. After evaluating over 30 test management software systems, NetSuite turned to Polarion QA to manage all of their testing needs with a single solution. - Milan Vondra, Director of Quality Assurance, NetSuite, Inc.